Which States are Holding Working People Back? Are you living in an area where your local government has enacted policies that raise the standards of working people, only to have your state legislature pass state laws that lower standards through preemption? Check out this map to see if your state has preemption laws holding workers back. 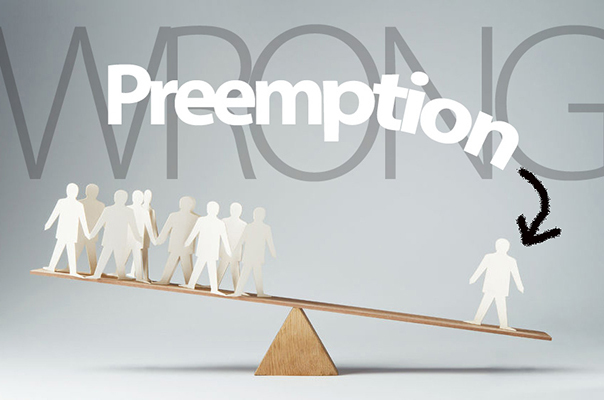 Preemption is the use of state law to void local ordinances. Twenty-six states across the country have preemption laws targeting these five key worker laws: minimum wage, fair scheduling, project labor agreements, prevailing wage and paid leave. The Economic Policy Institute has put together an interactive map highlighting the states with preemption laws and what worker protections they are oppressing. Check out the map to see if your state lawmakers are keeping your city, county, or other local government from looking out for your best interest.